Point Pleasant defenders Cason Payne (7) and Josh Wamsley (2) combine to bring down a Warren running back during a Week 3 football contest at OVB Field in Point Pleasant, W.Va.
Point Pleasant junior wideout Aiden Sang (33) breaks away from a Warren defender during a Week 3 football contest at OVB Field in Point Pleasant, W.Va.
PARKERSBURG, W.Va. — The Point Pleasant football program secured its 11th straight playoff berth and a sixth consecutive postseason game at home with the announcement of the 2018 Class AA bracket on Sunday by the WVSSAC. The Big Blacks (8-1) earned the eight seed and will host ninth-seeded Mingo Central (8-2) at 1:30 p.m. Saturday afternoon at Ohio Valley Bank Track and Field in Mason County. Point Pleasant — which will be making its 16th playoff appearance in history — owns an 11-15 all-time mark in postseason games. It will also be a rematch of the 2018 season opener for both programs, which PPHS won by a 42-35 margin in Matewan. The Big Blacks are 55-8 at OVB Field since the stadium opened in 2009, including a 9-4 mark in playoff games. PPHS coach Dave Darst is also 9-10 in playoff games overall during his 12 seasons at the helm. 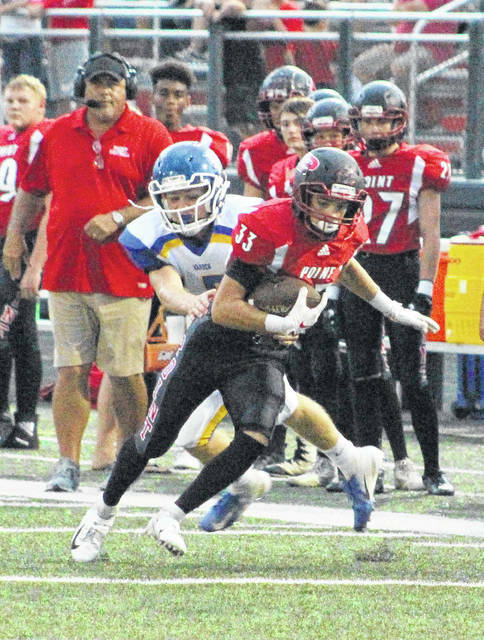 Point Pleasant — which has a playoff win in each of the past five seasons — has won 27 of its last 31 decisions in the friendly confines of OVB Field. The Miners are making their seventh consecutive postseason appearance, which includes a Class AA championship during the 2016 campaign. MCHS is also 4-1 in road contests this fall, with the loss coming at Poca (45-27) in Week 5. Both Wahama and Hannan failed to qualify for postseason play after finishing the 2018 campaign with identical 1-9 marks. 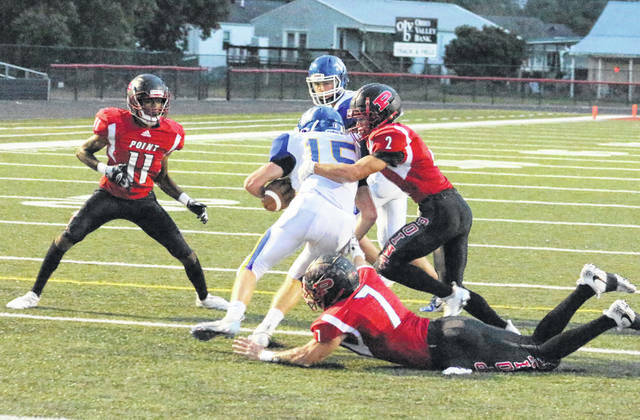 Like top-seeded Fairmont Senior (10-0) and fourth-seeded Nicholas County (10-0) in Class AA, each classification has two unbeaten teams apiece at the start of their respective playoff tournaments. Second-seeded Midland Trail (10-0) and fifth-seeded Cameron (10-0) are in Class A, while Martinsburg (10-0) and Spring Valley (10-0) both sit 1-2 atop the Class AAA bracket. Second-seeded Bluefield (9-1) is the defending Class AA state champion headed into the opening round of the playoffs. Top-seeded Wheeling Central Catholic (9-1) and top-seeded Martinsburg are the reigning champions in single-A and triple-A, respectively. The 2018 WVSSAC football playoff pairings for each classification are listed below with seeds and game times. (1) Wheeling Central (9-1) vs. (16) Tyler Consolidated (6-4) – Friday, 7:30 at Brooke H.S. (3) Mount View (9-1) vs. (14) Ritchie County (7-3) – Friday, 7:30 at Princeton H.S. * — all start times are in the p.m.